Directions for Pomegranate Jam: Grate enough of the apple (including the peel) to yield 3/4 cup. In a medium saucepan, bring the grated apple, pomegranate juice, sugar and cranberries to a simmer over medium heat. Simmer, covered until the apple is softened and the mixture has thickened a little, about 10 minutes. Uncover and continue to simmer, stirring occasionally at first and then constantly toward the end, until the liquid has evaporated and the mixture is reduce to 3/4 cup, about 5 minutes. With a rubber spatula, press the pulp through a medium-mesh strainer into a bowl until you can't get any more juice out of the pulp. Scrape all the juice clinging to the bottom of the strainer into the bowl and discard the pulp in the strainer. Directions for Cheesecake: Early in day. Preheat oven to 375° F. In food processor, blend cheese, sugar, eggs, and nutmeg. Spray six 10-ounce custard cups with cooking spray. For each dessert, place 1 phyllo sheet on work surface; spray with cooking spray; repeat to make 1 more layer. Using 1 custard cup as the base, gently ease center of phyllo into bottom and up side of cup (phyllo will hang over). Spoon scant 1/3-cup cheese into center. Spoon 1 tablespoon pomegranate jam over cheesecake mixture. 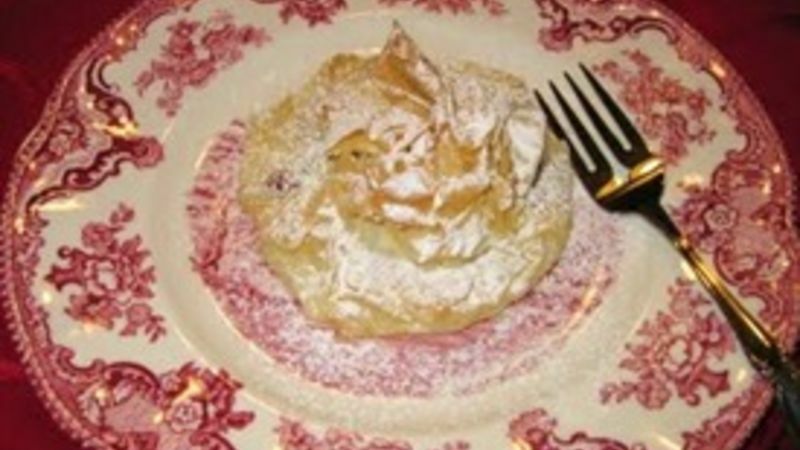 Bring phyllo up over filling, bunching edges together to form a ruffled design on top/ spray with cooking spray. Repeat to make 5 more phyllo cups. Arrange cups in jelly-roll pan. Bake about 20 minutes or until phyllo is golden brown. Refrigerate. To serve, remove from custard cups. Sprinkle with confectioners' sugar.